The oft-breached, oft-repaired chain-link fence separating the Safeway store in downtown Kailua from next-door retailer Daiei will come down Oct. 6, according to the area's landowner. The fence has been up for many years, forcing many shoppers to drive from one parking lot to the other to reach the retailers and their neighboring businesses. In previous decades, Daiei Inc. officials had been concerned about losing parking spaces to Safeway shoppers, but Daiei's Hawaii stores were purchased by Japan-based Don Quijote Co. Ltd. in February. A Don Quijote spokeswoman declined comment yesterday. A long-standing fence between the Kailua Daiei and Safeway parking lots has forced many shoppers to drive around to next-door businesses. That is coming to end. Every three months or so, somebody would take "unilateral action" to cut a hole in the fence, necessitating continued repairs, said Mitch D'Olier, president and chief executive officer of Kaneohe Ranch Co., which owns the land under both stores. "We started a dialog with Don Quijote about the fence as part of our community planning process," he said. Part of what emerged from the process was a desire for a better pedestrian environment "and that fence drew more attention than any other," D'Olier said. The overall plan is to make downtown Kailua work better for pedestrians. "We got a very favorable response from Don Quijote and we are extremely grateful for them, for their willingness to go forward and allow the fence to come down." 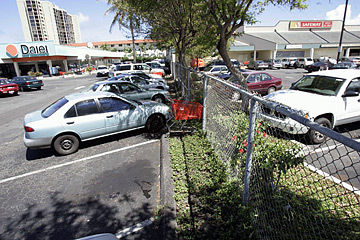 Safeway Inc. and Vision Windward LLC, which has the master lease on the land, also approved the fence's removal. "The whole pedestrian thing should make traffic better, without putting more traffic on Hahani Street. That's a little crazy, which I think is the point," D'Olier said. An official announcement with more details is pending "and there's more planning to be done, but we're really happy we were able to get this done for the community."